There are several nautical events on this weekend's boating and fishing calendar, and if you're not out on the boat - or if you don't have one yet - remember that it's the first weekend of summer. That's the perfect time to head to a boat show. Houston, we've got a boat show (love that joke!) There are no problems here... the Houston Summer Boat Show started Wednesday and runs through Sunday, June 24th 2012, at the Reliant Center in Houston, Texas. 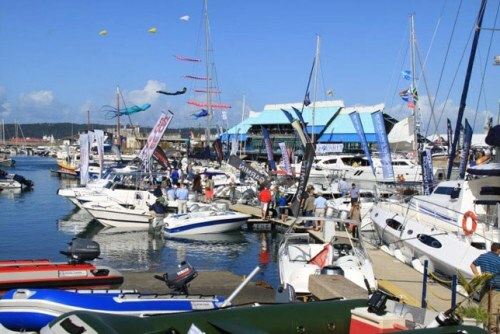 A little further away than Houston, but well worth the trip, is the Durban International Boat Show at Durban Marina in Durban, South Africa. The show website says that at this time of year Durban is at its balmy best - clear days, bright sunshine and gentle breezes - a wonderful time for looking over everything that's new in the extraordinary world of boating. On Saturday, you may run into a former VP nominee at the Anchors Aweigh Summer Boat Show. Why? Because this one-day boat show is being held in the infamous town of Wasilla, Alaska, at Rum Runners Resort. Rumor has it you could see Russia from there, in addition to a lot of really great boats. The Newport Charter Yacht Show ended today (Thursday, 6/21/12), but many of the big yachts are probably sticking around for a few days. If you miss them, you can check out our photos on sister-site Northeast Boater. But if you wander into Newport a few days late, you'll be just in time for the final stop in the inaugural America’s Cup World Series (AC World Series), which will feature both fleet and match racing. Head a little further east this weekend and you'll find the Second Annual 2012 Hyannis Tuna Fest on Cape Cod, with anglers vying for a $10,000 cash prize.